Hmm, I don't know what to say when I receive socks for Christmas... so I was worried about turning in enough words for a review. They are socks. You put them on your feet. Your feet stay warm. Is that enough? Okay, all joking apart, Gallant & Beau have done an impressive job of not only producing a pair of socks that feel like a quality item (which they are), but also spending a bit of time ensuring that the gold three-headed dragon sigil of House Targaryen, that is embroidered on the sock, looks and feels like something more expensive that it is. 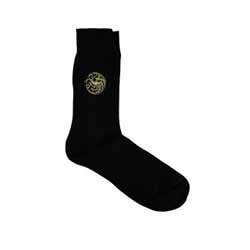 The socks come in a variety of colours and sigil styles, so you can show you allegiance to the house of your choice. This is the perfect gift for that difficult to buy Game of Thrones fan in your life.